A premium natural nutrition company wanted to revive a list of 150,000 people that had gone cold. Copywriter Xristopher Bland shares how he helped a list with an average 2% open rate get a 950% open rate increase. Read on for the five key email optimization principles along with a detailed look at two of the (very untraditional) emails Xristopher wrote. Perhaps unsurprisingly, my story of email optimization as a Canadian copywriter began with snow and cold, and looking forward to no longer having hat head (meaning spring). Fast forward to the offices of Optimal Health & Wellness where I’d been working for about a year as a copywriter. It was late in 2017, and the Director of Customer & Email Experience tasked me with a challenge. The company wanted to increase email open rates for a list of about 150,000 people who’d once shown interest in the company’s weight-loss supplements. The Problem: The company had so steadily inundated prospects with traditional sales emails, the list had gone completely cold with roughly a 2% open rate. Prospects had determined “These guys just want to sell me stuff,” which is the same as some “friend” constantly asking you for money. Prospects simply didn’t like the company anymore, and no amount of hammering with more traditional sales emails could ignite an improved open-rate pulse. You don’t drive traffic. You attract it. In marketing emails, the purpose of the subject line is to compel the open. It’s not to try to make a sale. The purpose of email content is to compel the click, which equals the kind of person a prospect will become by doing something. Customer-first marketing puts prospects and customers above the needs of a company. Email is a conversational medium. People are not leads. People are people. So treat them like people. With these five principles as my starting point, I drew on intrigue and crafted an email that blended a universally loved character (Darth Vader) and a globally loved food (pizza) with humorous content designed to re-engage. While I included a call-to-action at the end of the email, my main goal was to re-ignite brand affinity while strengthening prospect connection. 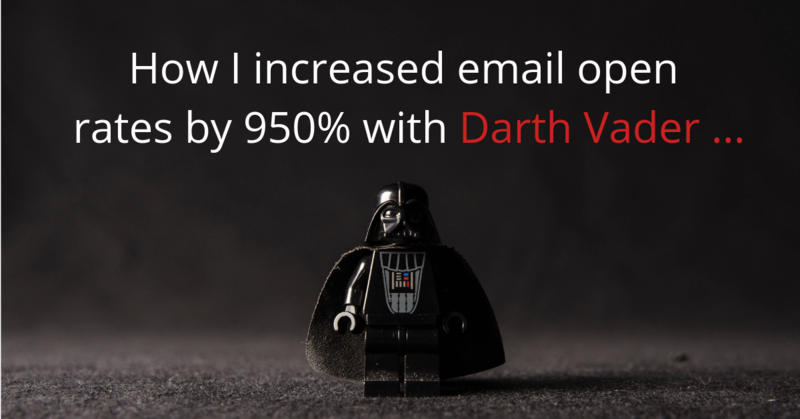 The Result: The email ignited a 21% open rate from a completely cold list. To put that in perspective, by foregoing a traditional sales email, I outperformed the average email open rate for all industries in 2017 (20.81%) and increased the company’s open rate by 950%. As an example of the three core concepts under a different subject and style, the follow-up emails included “The Wheelchair Skateboarder,” a true story written to change how prospects see themselves (the customer perspective) rather than trying to change how they see a weight-loss product (the company perspective). The Result: The follow-up emails consistently saw open rates around 18-20%, and a formerly dead clickthrough rate began showing signs of life. The Result: The emails re-ignited both lists. Open rates immediately clocked in around 17-21%, and gradually, clickthrough rates and conversions showed a good pulse. But what had I been doing? Sure, I’d figured out something that felt like a formula. Yet the sheer number of variables led me to realize there was something else working in the emails that transcended empirical examination. There was some sort of ghost in the machine, and in my desire to understand it, I asked the director of customer & email experience what he thought it was. I remember him sort of laughing, seemingly puzzled that I couldn’t see the answer when it was so plain to him. “Just keep doing Xris,” he said. In his view, formulas were fine as general guidelines in marketing because replication serves growth and profitability. Yet to microscopically dissect my emails and boil the parts down into a fill-in-the-blanks template would be to negate the humanness of the emails in all their imperfection, quirkiness and personal signature — the very qualities that, in the Director’s view, had ultimately connected with people. I continue to field-test the effectiveness of this approach today, and I’m happy to say, I continue to see the results. This article was originally published in the MarketingExperiments email newsletter.